I don't want to offend anyone but there seems to be a wealth of knowledge here. Do any of you guys or gals teach a foreign (non English) language or by chance speak Cherokee? I could probably help you out with the finer points of Southern Redneck. Does that count? Hmmm ... I wouldn�t think Cherokee was a �foreign� language. Paul Revere and the Raiders might be able to help you. between you & the other party. Native American language(s) might be foreign to us - but they are the true indigenous language(s) Of The Land. FWIW: I don't know if the Seneca and Cherokee languages have any relation to one another, but there are a lot folks in my area who speak Seneca. It's even taught in several area public schools. 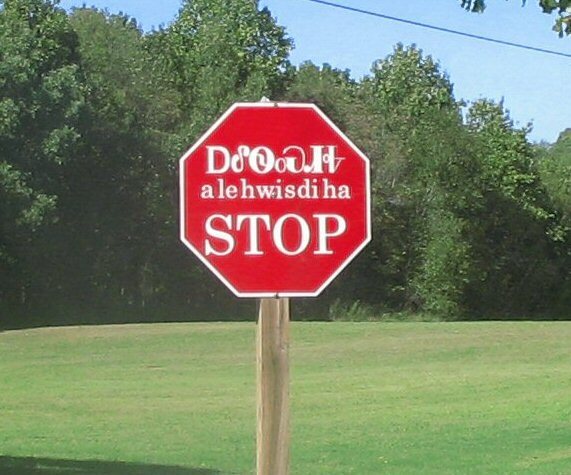 Matter of fact, on the reservation, nearly all road signs have Seneca translations on them. In 2007, the Tulsa club put on a tour headquartered in Sallisaw OK. One of our visits was to the Cherokee Heritage Center. This was just outside.